Need an official transcript or replacement diploma? Students and graduates requiring an official transcript or diploma reprint may use the official transcript order form. Click the link below and follow the instruction on the order form. Transcripts are $ 10.00. Diploma re-print/padded cover is $ 29.00. Processing generally requires 3-4 business days. All request are verified with student records before processing. 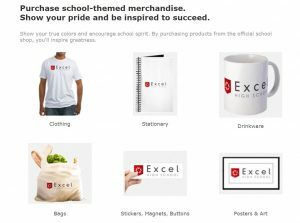 Show your Excel High School pride and order items from the Online Store.